Tara Simmons has always had psychic abilities for as long as she can remember. And she’s suffered from night terrors where a shadowy man pursues her. The Shadow Man found her once before when she was sixteen years old and slaughtered her parents. And now, nine years later, he’s found her again. The Shadow Man is killing people as he works his way closer to Tara. She can see the murders through his eyes, the clues left behind, and he wants it that way. 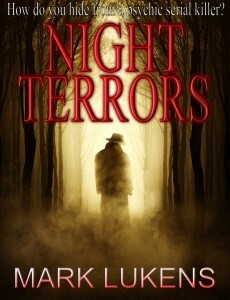 He takes things from each victim; blood, skin, and other items he needs for his bizarre ritual. But it’s all leading up to the most important and central piece of the ritual – Tara. I’ve always loved books and movies about serial killers lurking in the shadows – and the ones I’ve loved the most is when a victim fights back. Tara Simmons has had a rough past. Because of her psychic abilities, she has always suffered from severe nightmares and night terrors, often bolting out of the house or hiding in her sleep. At age sixteen she ran out of the house during a night terror and her parents were murdered by the shadowy killer from her dreams. But the killer went from room to room, leaving behind bloody footprints as he searched for Tara. Tara moves in with her aunt, and her aunt moves them from place to place, always fearing that the killer who murdered her parents would come back to find her and finish the job. A few years later Tara moves down to Tampa, Florida to go to art school and eventually run her home-based graphic design business. And as a series of bizarre murders begins in Tampa, Tara sees the crimes through the killer’s eyes as he works his way closer and closer to her. I love the character of Tara. She’s vulnerable but there’s a strength to her. She wishes she could be in a relationship, but because of her night terrors (and attacks on former boyfriends in the middle of her sleep) she feels she’s destined to be alone. She’s suffered for years from panic attacks, nightmares, and night terrors, but she learns to overcome these as she eventually makes the decision to fight back against this shadowy man who has pursued her for a long time. I’ve been writing since the second grade when my teacher called my parents in for a conference because the ghost story I’d written had her a little concerned. By the time I was fourteen years old I was reading every Stephen King book I could find in the public library. I was hooked – I knew I had to be a writer. I’ve had several stories published and I’ve had four screenplays optioned by producers in Hollywood, one script is being considered for production by a major studio. I’ve written five novels and a collection of short stories (Ancient Enemy, Descendants of Magic, The Summoning, A Dark Collection: 12 Scary Stories, Ghost Town, and Night Terrors), all of which can be found on Amazon/Kindle. I’m also a member of the Horror Writers Association. I grew up in Daytona Beach, Florida, but after many travels and adventures, I settled down in Tampa, Florida with my wonderful wife and son, and a stray cat we adopted.